All hail Marx and Lennon. 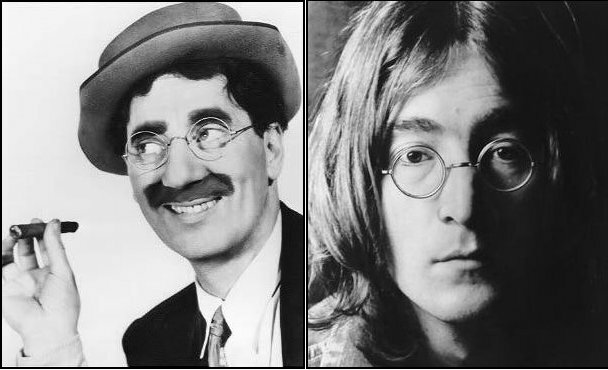 The Marx in question, of course, was not Groucho, Harpo, Zeppo, or even the 1980s pop-rock singer Richard Marx. It was Karl Marx (1818-1883), whose villainous shade terrified generations of schoolchildren, and more than a few American politicians, from 1917 to 1991. That terrifying figure, of course, was the Marxist boogeyman of right-wing legend. The real Marx was a considerably less threatening presence. He wasn’t a very nice fellow, to be sure: a personality defect he shared with Beethoven and Wagner. Mostly, however, he was just an academic scribbler with dreams of changing the world. But the question “Was Marx right?” is too blunt an instrument. Right about what? Marx was an economist, political philosopher, social analyst, activist, and anti-Semite. He had a lot of opinions about a lot of things. Some of them were daft. Some of them, however, are starting to seem pretty brilliant. Unlike the nightmarish cartoon of his alter ego, Marx did not come out of nowhere. He followed in the footsteps of other classical economists and tried to solve problems that had stumped them. Chief among his predecessors was Adam Smith (1723-1790), who in 1776 published The Wealth of Nations, a book that set the agenda for all work in economics since then. Conservatives and libertarians often wear ties bearing Smith’s picture, but they’ve never actually read anything he wrote. They wouldn’t like him if they did. In talking about Marx or any other economist’s theories, it’s important to understand what economics really does. Almost all economists, for example, talk about what tends to happen in the long run and “at equilibrium.” But the long run is always in the future and the economy is never at equilibrium. All economists, regardless of their ideological biases, tell a story about how they think the economy works and where they think it’s going. They can often cite evidence to support their stories, but the economy is so complex that that there’s usually some evidence to support almost any theory. As a result, it’s impossible to “prove” that one economist’s story is right and another’s story is wrong. What you need to do is compare what the story says with what you see going on in the world. How closely do they match? How well does a story explain the current economic situation and predict future economic developments? Does a story make internal sense? A story that matches reality, explains well, predicts future events, and makes internal sense is a good economic story. Marx’s story is a fairly good one. So is the story told by Keynesian economists. So is the story told by monetarist economists, though the true parts of that story are included in the Keynesian story. Conservatives often prefer the story told by Austrian economists, although — or perhaps because — that story has turned into little more than an apologetic for big business. Marx was trying to solve a problem that had baffled earlier economists, including Adam Smith. Second, they assumed that if two things exchanged for each other, then they had the same amount of economic value. Third, they assumed that when workers got paid, they were exchanging the products of their labor for the money from the capitalist. By those assumptions, the products of workers’ labor should tend to be equal in economic value to the money paid by the capitalist. But if the capitalist pays workers exactly what their produce is worth, and then sells it for exactly what it’s worth, then there’s nothing left over for the capitalist. Where does the capitalist’s profit come from? Marx answered that the capitalist was paying for not for the products of the workers’ labor, but for the workers’ labor power: for their ability to produce. Instead of buying what the workers made, the capitalist was basically renting their ability to make it. And notice what Marx did: He took the same facts as Adam Smith, but told a different story explaining those facts. Like any other commodity, the workers’ labor power has its economic value (price) determined by how much labor is required to produce it. In other words, wage levels are determined by how much it costs to feed workers, house them, and sustain their ability to produce value for the capitalists. Suppose that it takes only four hours of an eight-hour working day for the worker to produce enough to keep himself or herself alive and producing. Under the capitalist system, that’s the value of the worker’s labor power and that’s how much he or she will tend to get paid in the long run. But the workers still work an entire day for the capitalist, who pays them only for half a day. The extra half-day for which the workers don’t get paid is the “surplus value” that the capitalist receives as profit. Note that this isn’t because capitalists are bad people: some are and some aren’t. Surplus value exists because of the way the capitalist system works. The capitalist doesn’t produce anything himself, but he gets money because he has money. Most modern economists disagree with this view, but in Marx’s time, it was a tremendous insight and a great leap forward. Most modern economists take a more, shall we say, “cooperative” attitude toward capitalism. Instead of saying that the worker’s labor has a specific value — even if that value is sometimes difficult to calculate — modern economists say that its value is subjective. In other words, the worker’s output has no specific value: instead, it’s worth whatever the capitalist says that it’s worth. There can be no “surplus value” because the value of what each worker produces is defined as whatever the capitalist pays him or her. No matter how low wages get or how high profits get, no matter how unfairly the system is rigged in favor of Wall Street, corporations, and the politically-connected rich, it’s all good. The workers get paid only a pittance because that’s all their labor is worth. The capitalists and their top managers get paid a fortune because — well, because they must be contributing something valuable or they wouldn’t get paid so much. That’s what passes for logic in modern economics. Marx’s greatest insight was in seeing how capitalism distorts our way of seeing the world. Under an economy of simple commodity production, each worker produces a good or service. He/she exchanges that good or service for money, and then exchanges the money for other goods and services. For example, a farmer grows wheat, exchanges some of the wheat for money, and uses the money to buy clothing. So the pattern of economic life is C-M-C: commodities get money, which in turn gets more commodities. Useful things are the beginning and end of the process, with money seen only as an instrument to get them. Under capitalism, however, the capitalist starts out with money, uses it to buy goods and services (raw materials, machinery, and labor), and then exchanges the result for more money. The pattern is now M-C-M: money is the beginning and end of the process, the Alpha and the Omega. No longer merely an instrument to buy useful things, money becomes the center of the capitalist society’s worldview, as it has become the center of ours. Marx saw occasional economic crises not as a problem for capitalism, but as an essential feature of the system. Economic crises throw people out of their jobs and into the “reserve army of the unemployed,” to strike terror into any workers who still have their jobs. That makes wages drop and gives capitalists relatively more profit both during and after the crisis. The current recession follows the pattern Marx predicted. As millions of workers have lost their jobs, and others have taken pay cuts, Wall Street and corporate profits are higher than ever before. There are currently five unemployed people for every new job. Hundreds of people apply even for the most menial and low-paying job openings. Workers know that they can easily be replaced. It’s a race to the bottom. Marx didn’t get everything right. His explanation of what causes economic crises (changes in the “organic composition of capital”) is dubious. His conception of human nature (not discussed here) is completely unrealistic. But on balance, particularly in economics, he got a lot more things right than many modern economists. Maybe that’s why we hear so little about him in our time. *Classical economists distinguished between economic value (price) and use-value (usefulness). To illustrate the difference, Adam Smith compared water to diamonds. The use-value of water is much greater than the use-value of diamonds: if you don’t get any water, you’ll die. Paradoxically, however, the economic value of diamonds is much greater than the economic value of water. A thing must have use-value in order to have economic value, but they’re not the same. **The difference is that classical economists thought the natural price of goods was determined by how much labor it took to produce them, but that supply and demand also influenced the current price. Modern “neoclassical” economics says that the equilibrium price of goods is determined by supply and demand, but that labor costs also influence the current price. The two viewpoints are essentially mirror images of each other, with classical economics focusing on how production affects prices and modern economics focusing on how market conditions affect prices. Both are valid viewpoints, and each is useful in analyzing different aspects of the economy. Marx, Karl, Capital, Volume I. London: Penguin Classics, 1976. There are three volumes of Marx’s Capital, but you can get most of the essential ideas from Volume I, which is available inexpensively in paperback. Sweezy, Paul M., The Theory of Capitalist Development. New York: Monthly Review Press, 1970. This is a classic, definitive, clearly-written primer about Marx’s economic theory. If you just want to get the basics, it’s the best. Tucker, Robert C., ed., The Marx-Engels Reader. New York: W.W. Norton, 1978. This is very good, Noah. Hope you are well. You’re often in my thoughts, as are G and O. I hope that you’re all happy and doing well. I’m sure that G is growing up fast. She has a good role model. Eh, how did _that_ become my icon?